Surveillance video of George Zimmerman arriving at a Sanford, Fla. police station indicates what may be an injury to the back of his head, a Daily Caller analysis shows. ABC News reported that Zimmerman appears uninjured in the video. 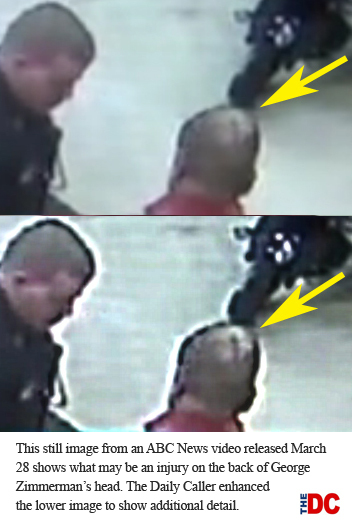 But a still image from the video indicates what appears to be a vertical laceration or scar several inches long. This doesn’t mean registered Democrat George Zimmerman is innocent of a crime but it does show what appears to be marks from a scuffle.